It was taken with a phone and is kind of dark, so I'll describe it: hat is rolled up - it can be pulled down over your face if you're going to be out for a long time, turning out, etc. A down filled jacket (it's a nice Eddie Bower jacket that I got for $5.00 at Frenchies, a locally famous line of used clothing outlets - I could write pages about my Frenchies finds) over a fleece top, insulated riding pants (in this case Elation, they were just what I had), breeches underneath for riding later. Light socks with wool socks over, inside Bogs. I have to give Bogs credit where credit is due. This is my first pair and I'll never be without them again. I ALWAYS get cold feet, and my feet weren't cold once, which seems like a miracle to me. They are light weight, water proof and warm. One of the other barn workers had Mud Ruckers, which seem to be of equal function. I think the key is that they are made of neoprene, so look for a pair of boots with that in mind if you have cold feet. The models to go for have 7 mm neo-tech insulation. Several people suggested options that might be cheaper and are comparable to Bogs in comments to an earlier post if you're interested. I got mine 20% off just before starting the month and I couldn't be happier with them. For gloves I wore insulated deer skin such as you can find at feed and tack stores and they worked well. I'd say 95% of the time the down jacket would be over-kill. Most days I wore the jacket(s) that went with the insulated pants - two layers. An inside insulated layer and outside wind and water resistant layer. I'd start off with both layers, quickly take off the top layer as I worked up a sweat, and then take both off and ride in the fleece top I had on as a first layer. Also, I only needed the insulated pants two or three times. This insulated riding suit was bought half price in the spring about six years ago and I've worn it to death and it still looks fine. If you go to my pictures page you'll see me wearing the jacket when I found Rogo in Alberta as a two year old. What I learned worked best for me most days is breeches as a first layer (the inside seam on long johns chafed my legs really badly when I walked in them all day), then I'd put something called power skins over the breeches. They are a Stanfields Underwear product. Stanfields is a Nova Scotia underwear producer and there is a factory outlet about 40 minutes from home, in Truro. It's one of my favourite stores! The deals are unbelievable. Anyway, the power skins are great - they are light weight with a really thin fleece lining and the outside of them repels things sticking to them unbelievably well. Hay and straw literally fall off of them. I discovered this by accident when I started wearing them on the outside instead of the inside of my breeches to avoid the inner seam on my leg. If anyone thought I was weird they were too polite to say :) It isn't too obvious - they just look like leggings and if you don't look closely they probably look like breeches. The other bonus of this arrangement is that you can just peel them off to ride and don't have extra layers inside your riding boots (I don't like winter riding boots - too bulky). Experienced barn workers often wear over-all or cover-alls. I'm not sure I'd find this a better option. I also learned that as much as I love stalls deeply bedded in straw, they are just too much work for me. Although straw is cheaper, I would end up spending more on labour because they take a lot longer to clean. At home we have stall mattresses and use shavings and I can do both stalls in about 15 minutes. It takes me a least half an hour to do a good job on one stall bedded with straw, and although I've heard it makes great compost, the manure pile builds up very fast. Turn out takes longer and is harder work than I realized. Our horses can go in and out on their own, so I haven't had to contend with turning horses in and out. The most I do is open or close a door. Turns out it's a pain :) Speaking of turn out, I'd read that you don't need alleys between the paddocks to separate the horses if you are using electric fence. At Frasers I was told you do need it. Any experience with this? Maybe it depends on how many and how frequently horses are coming and going. I also got a reminder that I'll push myself too hard and it isn't a good thing. 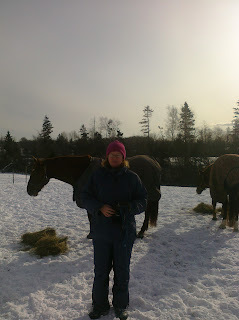 I was trying to meet all kinds if end of Feb. deadlines for tax issues and agriculture grants, and get ready for our dressage club annual general meeting, as well do management consulting at the other end of the Province, while doing hard physical work in the barn. Needless to say it didn't work and I backed off a bit on a few fronts. I learned about the human side of things too - the importance of creating and maintaining a positive atmosphere, the key role good barn workers play, etc. Another bonus - Sue is a great cook and after working in the cold all day she can put a delicous meal on the table for her crew in minutes. I've added several recipes to my repertoire! And speaking of food, for the first timer in my life I 'got' eating a good breakfast. It made a huge difference in my energy level. I met some great people, both other barn workers who I got to know better, and clients. In the interests of honesty I have to say I missed several days due to business obligations, and I didn't do as much as the permanent barn workers. All in all though, it was one of the hardest, but best months I can imagine. The people there, Sue and the other workers were amazing to share this opportunity with me. I got in some great riding for the month. I have a riding lesson tomorrow and I'll update and get back to my dressage training journal theme. Great post, Carol. Congratulations on finishing and learning so much. I bet you are in fantastic physical shape now too! Please comment or email me about the exact model of Bogs you chose. I need new boots desperately and couldn't decide which Bogs to get after you last post. Now I am 100% sold that I should get them, but when I go to the link from your last post, I don't know which model is best for barn chores and cold and temperature problems. I always have cold feet. Is the Neoprene inside too? It looks like it is just up on the ankle/leg part. My toes get cold. Can't wait to read part 2 about Rogo! I write such long posts and want to write more so I AM writing a book now! No kidding! Thanks for all the info - great! I agree about the shavings, although if my horses stayed stalled at all, I'd rethink that. Straw is probably way more comfy and inviting to lay down in. Your posts, and working at my old trainers barn have definitely convinced me that run in shelters with 24/7 turnout are the way to go. From the health of the horse standpoint as well as labor. You must be brimming with design ideas for your future facility. Can't wait to hear about Rogo! This experience will make all the difference when you are ready to build and run your facility. You approached this in a perfect way. We used to bed Nate with straw because he had a respiratory condition. I really didn't like the mucking process with straw, it took way too long and was hard. I guess if you get to be a pro at it maybe it gets easier. The Bogs sound good, I'm going to look into them for next year. Thanks for the info. I'll bet you're in good shape now after all the hard work. It's a great way to find what works and what you don't think is a good idea before you get your own place. A great experience all in all.